Spring trends are typically filled with the usual suspects—florals, pastels, a romantic dress style or two—so when we saw this fresh trend infiltrate the runways during fashion week, we were shocked and thrilled and all other kinds of excited. The trend we speak of can best be described as California-inspired, chill, and insanely cool. Designers sent out looks containing pieces we haven't seen circle the trend circuit for quite some time, including tie-dye, board shorts, wetsuits, beat-up sneakers, shell jewelry, and flip-flops. If the combination of those items doesn't instantly make you think of California, we don't know what will. Wondering how to get the look? That's where we come in. Ahead, you'll see some of our favorite California-cool runway looks that we feel best embody this exciting new spring trend, plus the shopping picks you'll need to get your beachy wardrobe going. Considering there are dozens of ways to incorporate this chill-vibey style into your wardrobe, we know it will be a trend that's going to forcefully take over the sartorial scene—and we can't wait. For now, sit back, relax, and enjoy the Golden State fashion we're ready to cop in 2019. 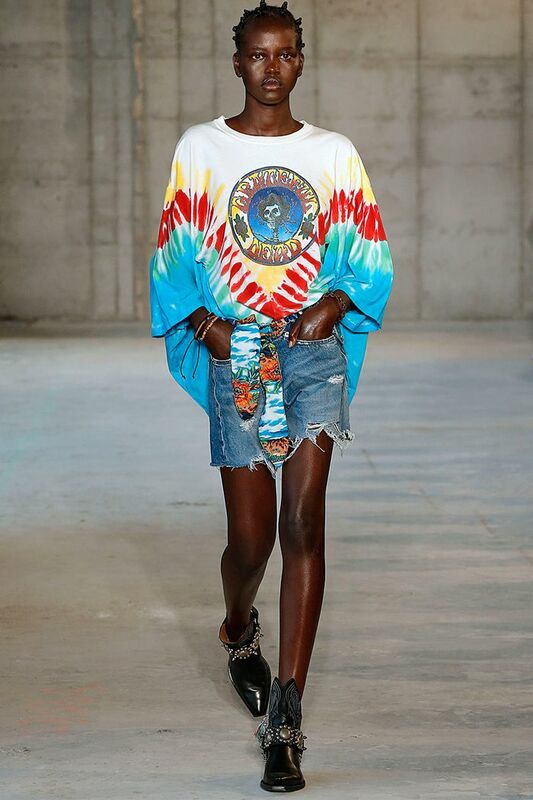 Style Tip: Grab an oversize tie-dye shirt and tuck it into your favorite distressed jean shorts. Bonus points if you tie a tropical-print belt around your waist. Style Tip: Remember when Carrie Bradshaw wore board shorts in the Hamptons? Well, they're finally cool again. Pair yours with worn-in sneakers and your favorite beachy jewelry. Style Tip: Wear your favorite boxy printed button-down open with a striking swimsuit underneath. The look will read "Yes, I was just at the beach, but I put on a skirt, so I'm ready for dinner." Style Tip: Pair your favorite fashion-girl bucket hat with your touristy Hawaiian shirts and printed skirts to give it a more polished feel. Oh, and wide brims are coming back, which we're particularly excited for. Style Tip: Layer a chunky cardigan over eclectic denim and a bikini top. All you need now is a bucket hat that perfectly matches your swimsuit. Style Tip: Wide brims, tropical prints, and… are those water shoes? Yes, this outfit is everything we could have asked for from this California-inspired trend and more. Get yourself a beachy print and wear it with all the shoobie goodies your heart desires. Style Tip: Get more use out of your old vacation merch by pairing it with structured pencil skirts and pumps. Style Tip: Never in our lives have we wanted a wetsuit skirt before, but this look is convincing us otherwise. The combination of this tie-dye swimsuit, neoprene, and basket bag is the futuristic version of this trend. Style Tip: When wearing a piece that really leans into this new 2019 trend, keep everything else minimal. Simple flats and a few accessories are what will make your look really pop. Style Tip: Is this look not the definition of chill? A loose tie-dye shirt, utility track pants, and sandals are probably going to become our 2019 uniform. The slight heel in this particular look makes the outfit feel a bit more fresh, but we won't judge you for wearing flip-flops instead. Style Tip: Further proof tie-dye shirts are the most versatile piece from this trend. Style them with everything from jeans to printed shorts and back again. Style Tip: But the printed shorts–and-belt vibe might be our favorite look so far. Up next, shop another spring trend you're about to see all over Instagram.